Manisha Gera Baswani is a painter, photographer, and an occasional writer.She recently curated her mentor and Guru, A. Ramachandran’s exhibition ‘The Changing Moods of the Lotus Pond and Insignificant Incarnations’ for Vadehra Art Gallery, in November 2018. Her solo exhibition was at Gallery Espace booth at India Art Fair 2018 and earlier at Sanat Initiative, Karachi in 2015. ‘Artist through the lens’ is a self-funded photography project that Manisha has been working on for the past sixteen years. 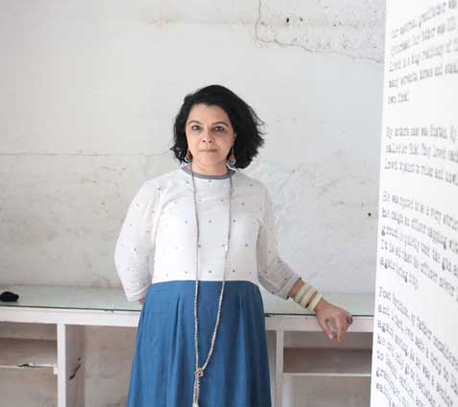 The project is centred on Indian and Pakistani artists photographed by her in their studio and creative spaces. ‘Artists through the lens’ was first showcased by Devi Art Foundation at the India Art Fair in 2012, post which, she was also invited to show it as a collateral project at the Kochi-Muziris Biennale in 2014. ‘Postcards from Home’, a project based on the partition of India (in 1947), bourne out of her on-going project ‘Artist through the lens’, was shown at the inaugural edition of Lahore Biennale and the Faiz International Festival 2018, also held in Lahore. The project will be showcased at the Kochi-Muziris Biennale 2018 as an invited collateral and the upcoming edition of India Art Fair. Manisha regularly contributes a photo essay column ‘Fly on the wall’ in ‘Take on Art’, a leading Indian biannual art journal. The artist lives and works in Gurgaon, India.